Vickie (Terflinger) Brown went to be with our Lord on July 17, 2018. After a long and courageous fight against cancer. She was born in Kettering, England to the late Msgt Charles Terflinger and the late Ruby (Payne) Terflinger on March 16, 1957 and came to the United States at nine months old. 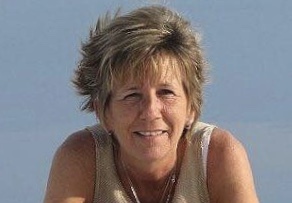 Vickie spent the majority of her life as a resident of Ft. Walton Beach, Florida which she considered to be her home. She spent the last ten years as a resident of Butler Pa with her husband Randy Brown. She attended the Christ Community United Methodist Church of Butler. Even though she never served in the military or public safety, Vickie was a veteran in support of her father and husband and all veterans of this country and for her husband and son for the Fire Service. Vickie was very proud of her children's careers and dearly loved her grandchildren. She always looked forward to their visits and wished she could be with them all the time. She is survived by her husband, Retired Fire Chief Randy Brown; her daughter, Catrina A. Reichel and husband, Retired Tsgt Todd Reichel, of Bath, Pa.; son, Division Chief Christopher Brown and wife, Serena, of Niceville, Fla.; grandchildren, Nicholas Reichel, Addison Brown, Logan Brown and Lilian Reichel; brother, Jay Terflinger and Debra Hamilton of Ft. Walton Beach; and niece, Kalee Terflinger; sister, Gerry Rogers of Destin, Fla; and nephew, Kyle; and niece, Danielle Rogers; and father and mother -in-law, Retired Sargent First Class Jack and Phyllis Brown of Butler; sister-in-law, Pam Schiebel of Butler; niece, Melissa Blicha and husband, Ben, of Georgia; nephews, Joey and Josh Schiebel; and niece, Ann Marie Schiebel all of Butler; and extended family from Mt. Sterling, Ohio and Kettering, England. The family will receive friends at Davis-Watkins Funeral Home, 113 NE Racetrack Rd, Fort Walton Beach, FL 32547 on Friday, July 27, 2018 from 10 am to 12 pm, with a funeral service beginning at 12 pm. Interment will follow at Beal Memorial Cemetery.